Savigny's brittle star Ophiactis savignyi, copyright Moorea Biocode. 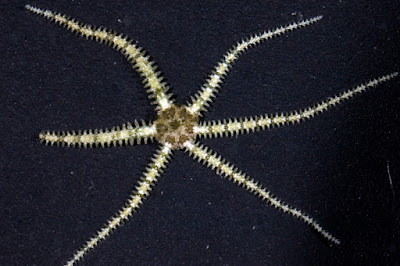 The Ophiactidae are a family of brittle stars in which the disc bears a covering of granules or spinules. Characters (from Spencer & Wright 1966): Arms slender, commonly constricted at nodes. Disc with granules or spinules. Jaws with lateral oral papillae separated by gap from dissimilar infradental papillae at apex.